Vermont composer Spencer Lewis is one such tunesmith who holds Andersen in the highest regard. 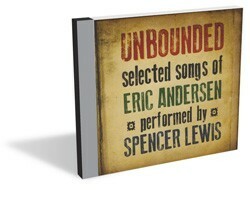 On Unbounded: Selected Songs of Eric Andersen, Lewis pays tribute to his songwriting hero with a collection of songs that serves as an intriguing and accessible introduction to Andersen’s work. Lewis, whose most recent credits include the Irene-themed instrumental, impressionistic folk album Vermont Resurrection, modeled his take on the Andersen songbook after the folk singer’s seminal 1967 album, ’Bout Changes ’n’ Things Take 2. That record is regarded as something of a folk-rock curiosity among music historians. It is quite literally a second take, essentially the same record as Andersen’s 1966 album, ’Bout Changes & Things, but sequenced differently and with added instruments. So perhaps in Lewis’ mind, Unbounded is something like Take 3. If so, he’s not far off the mark. While Lewis croons in a deliberate baritone compared to Andersen’s sly tenor, Lewis’ sensitivity to lyrical phrasing is similarly guileful, especially on crushingly heartsick tunes such as “Cross Your Mind” and “Violets of Dawn.” Andersen, for better or worse, was far more romantically than socially or politically motivated, especially compared to Ochs and other folk singers of the era. Lewis captures this facet of Andersen effortlessly. A cynic could question the value of re-creating another artist’s work while that artist is alive and still producing music. Why not just go buy one of Andersen’s 25-plus albums, or see him live? But on Unbounded, Lewis injects enough personal style and emotive force, both vocally and instrumentally — mirroring Andersen’s brilliantly nimble guitar style — to deliver the album from mere hero worship. It is both a fine tribute and a worthy introduction to the music of a great songwriter. Spencer Lewis performs at the Celebrate Vermont festival in Stowe this Saturday, August 25.